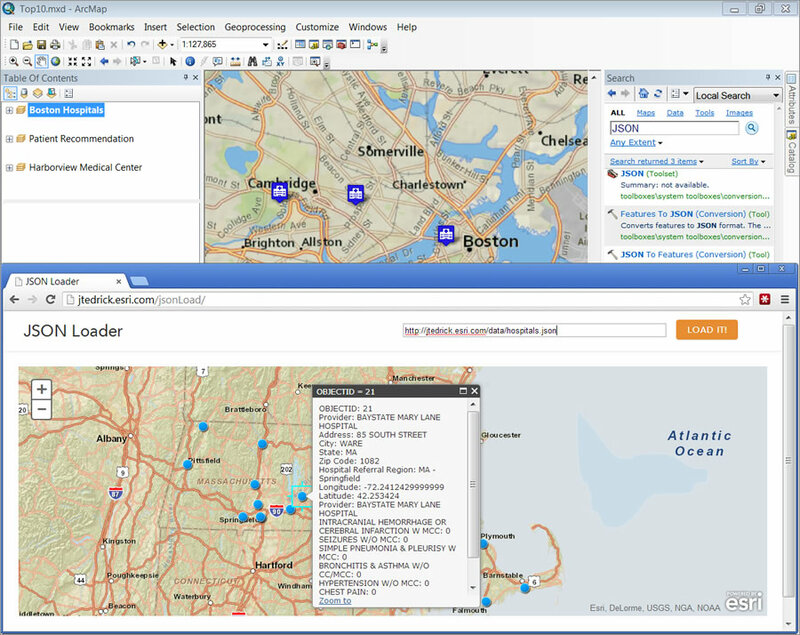 ArcGIS 10.2 added a new Excel toolset to convert Excel spreadsheets to and from tables. Whether you want to bring data into ArcGIS or export it to another system, it's now easier than ever to work with a wide array of data formats. New geoprocessing tools automate the process of importing and exporting native Excel spreadsheets. 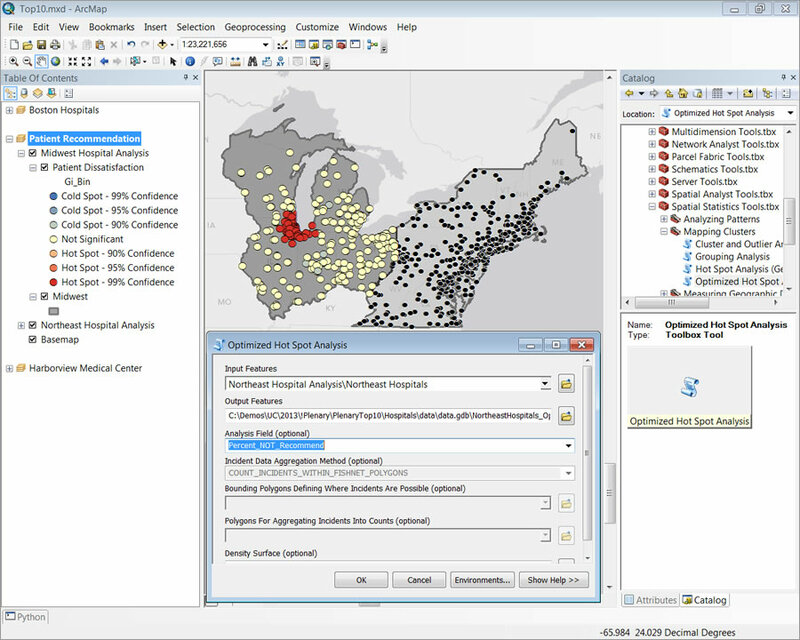 This automates data analysis and gives you the ability to analyze and share GIS data using ArcGIS or Excel. New JSON conversion tools for web developers will produce JSON-formatted data that you can quickly export and use in web applications. New tools make conducting analysis simpler to do. 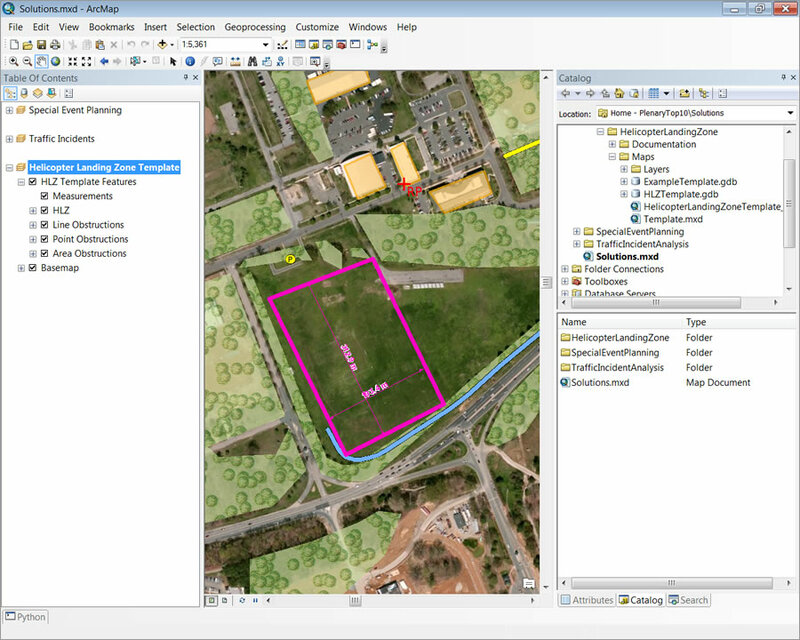 ArcGIS 10.2 streamlines complex, multistep workflows with the addition of data analysis tools such as the Optimized Hot Spot tool. You can use this tool to identify spatial outliers, calculate the appropriate scale of analyses, and generate statistically valid hot spots. It also automatically aggregates point events into gridded hot spots. This simplifies your work and creates statistically significant analysis automatically. A new JSON toolset converts features to and from their JSON representation. 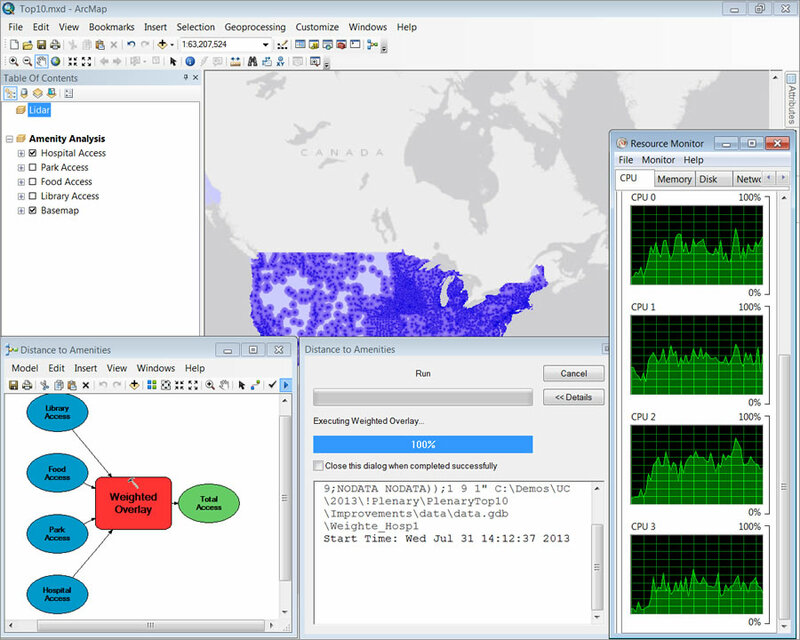 Generate statistically valid hot spots using the optimized hot spot analysis tool. As an ArcGIS for Desktop user, you can now access ArcGIS Online and use the analytical capabilities that Esri's cloud resources provide (ArcGIS for Desktop licenses now include a subscription to ArcGIS Online for Organizations.) These ready-to-use services are available through the Catalog window. 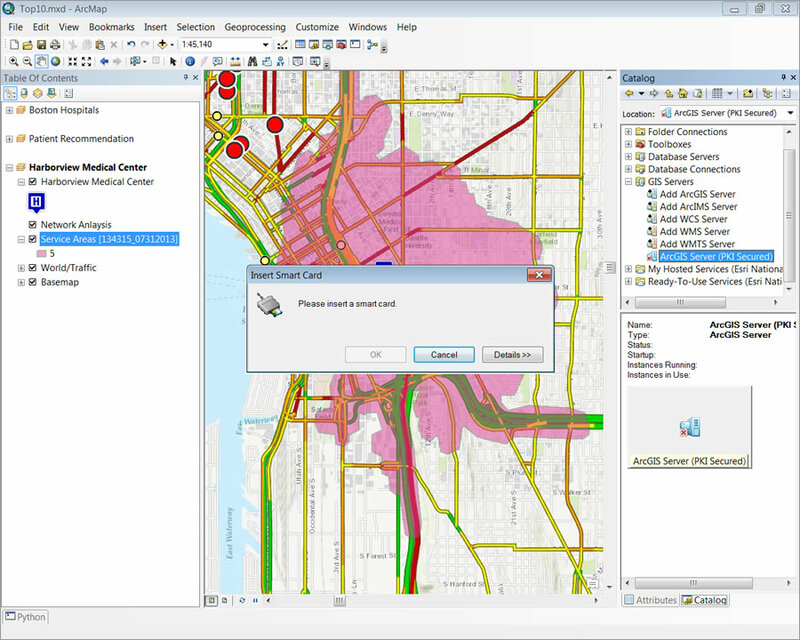 For example, you can do network analysis using Esri's World Traffic Service, which includes historic, real time and predictive traffic data for many parts of the world including traffic flow and accidents. Data security is always a top priority. ArcGIS now supports public key infrastructure (PKI) identity management to secure services. This means that ArcGIS can access the authorizations from smart cards provided by your IT department instead of logging in with user names and passwords. ArcGIS can access security authorizations from smart cards. Obtain tools, samples, and web applications at the Esri GitHub site. Portal for ArcGIS can now host services, just as ArcGIS Online does. 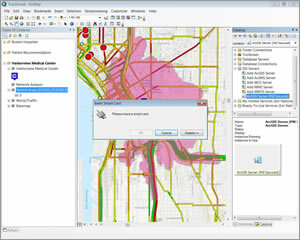 You publish the services not only using ArcGIS for Desktop but also from other apps such as Excel using Esri Maps for Office. The services can then be shared and managed through Portal for ArcGIS and removed automatically when deleted. Esri's many solution templates make it easy to get started with specific workflows such as editing parcel information, identifying helicopter landing zones, and making special-event operational plans,. These templates include map documents and data structures as well as sample data so you can quickly learn the workflow. 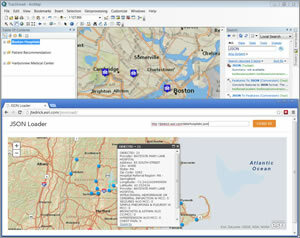 You can find the templates in the ArcGIS Resource Center, where they are organized by industry. 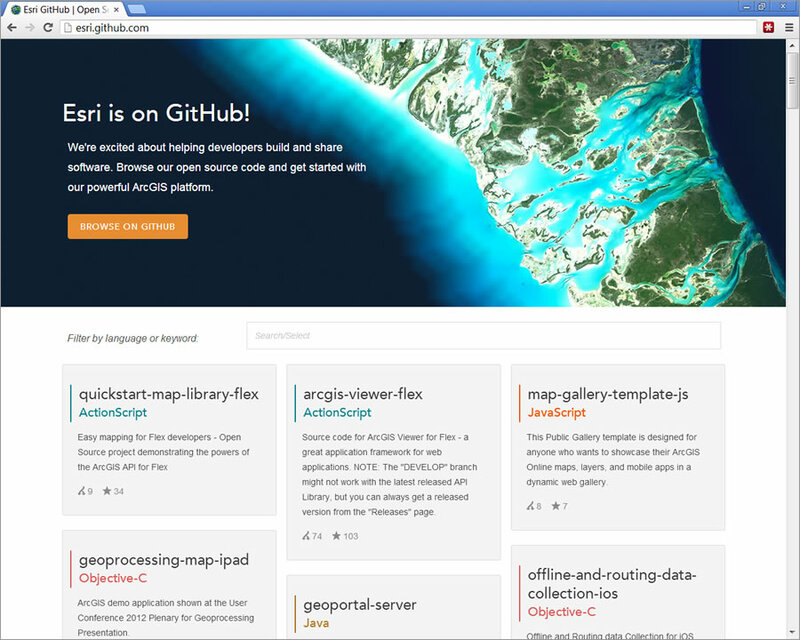 Tools, samples, and web applications also are now available at the Esri GitHub site, a social coding website. From there, you can download the code for a project or copy the project to your own GitHub account. This makes it easy for you to get started with a web mapping project or customize one of Esri's applications. 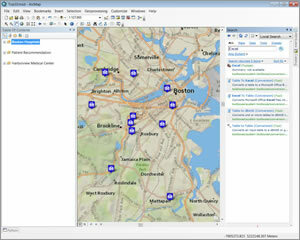 Esri offers many templates to help speed up your workflows. Complex analyses using tools such as Weighted Overlay can now be done faster. 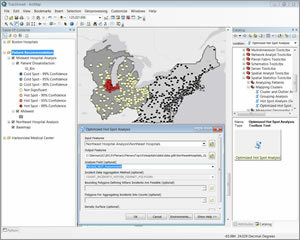 At ArcGIS 10.2, spatial indexes for LAS files are automatically calculated. This improves the performance of analytical operations with large datasets stored on network shares. 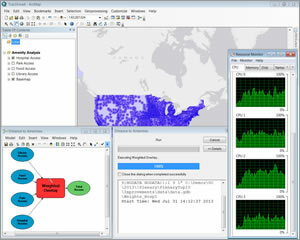 Many geoprocessing tools, like Weighted Overlay, have been rewritten to take advantage of all available processors so complex analyses are performed more quickly. 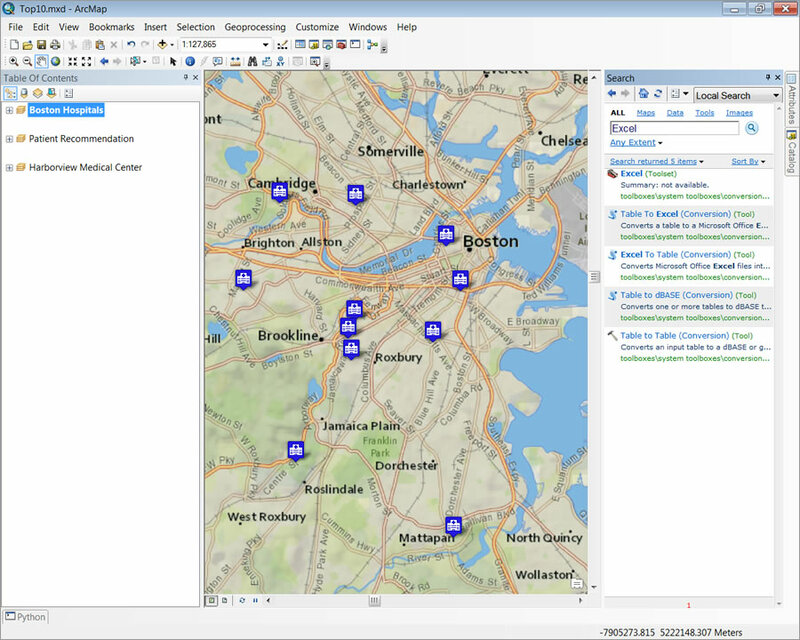 Read more about all the new features in ArcGIS 10.2. Watch this video by Jim McKinney and James Tedrick, recorded at the 2013 Esri International User Conference, where they go into greater detail about the improvements in ArcGIS 10.2.